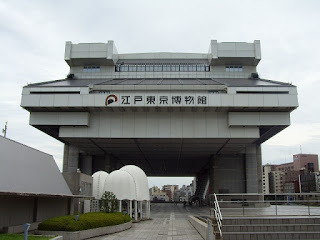 The Edo-Tokyo Museum (江戸東京博物館) is a museum of the history of Tokyo, established in 1993. The main features of the permanent exhibitions are the life-size replica of the Nihonbashi which was the bridge leading into Edo; the Nakamuraza theatre; scale models of town; and buildings from the Edo, Meiji and Shōwa periods. The original "Golden Mask" of the Tower of the Sun"
The Edo-Tokyo Museum was designed by Kiyonori Kikutake. The distinctive elevated shape of the museum building is modelled after an old storehouse in the kurazukuri style. Walking through the Museum is like travelling from the Edo of past centuries into the modern Tokyo of today. Edo (江戸, literally "bay-entrance" or "estuary"), is the former name of Tokyo. It was the seat of power for the Tokugawa shogunate, which ruled Japan from 1603 to 1868. During this period it grew to become one of the largest cities in the world and home to an urban culture centered on the notion of a "floating world". 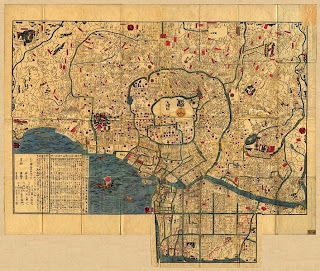 The city was laid out as a castle town around Edo Castle. The Sumida River (then called the Great River, 大川), ran along the eastern edge of the city. 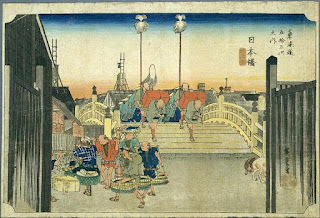 The Edo Bridge (江戸橋) marked the center of the city's commercial center. The northeastern corner of the city is guarded from evil by a number of temples (including Sensō-ji and Kan'ei-ji). 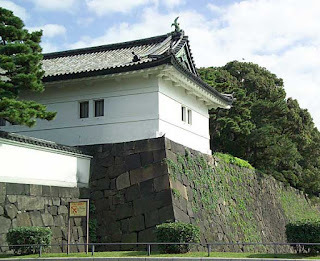 Edo Castle (江戸城), also known as Chiyoda Castle (千代田城), is a flatland castle that was built in 1457 by Ōta Dōkan. It is located in Chiyoda in Tokyo, then known as Edo. It was the residence of the shogun and location of the shogunate, and also functioned as the military capital during the Edo period of Japanese history. When the shogun departed and the Meiji Restoration it became the Tokyo Imperial Palace. Some moats, walls and ramparts of the castle survive to this day. 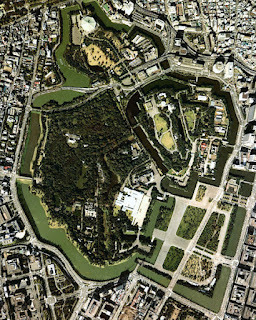 However, the grounds were more extensive during the Edo period, with Tokyo Station and the Marunouchi section of the city lying within the outermost moat. It also encompassed Kitanomaru Park, the Nippon Budokan Hall and other landmarks of the surrounding area.